BMW’S latest bikes prove you can ride 600 miles a day without the aid of a chiropractor. Our 1800-mile round trip to the south of France included the chance to ride three updated models. And the flat twin-powered R1150RT tourer and R1150R roadster and four cylinder K1200RS sports tourer all took the trip in their strides. More than 600 miles in a single day on the RT showed it is a comfortable and competent tourer – with no complaints of numb bum from the riders. The RT features the grunty 1130cc motor from BMW’s GS trailie. It’s 45cc bigger than the old boxer motor and boosts power from 90 to 95bhp at 7250rpm. A new six-speed box, with a long " overdrive " top gear means no fuss and no vibes as you pile down the motorway. BM’s Integral ABS system, which prevents locked wheels during braking, is standard along with a pannier set and luggage rack. Weather protection is superb, with an electronically-adjustable screen keeping any buffeting at bay. 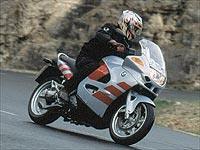 The R1150R also features the 1130cc twin although it has been retuned for bottom end grunt with peak power of 85bhp. It’s a cute looking bike which won plenty of admiring glances parked outside pavement cafes in the picturesque riverside town of Albi which was our destination in the south of France. It’s also great fun to ride with nimble handling which made tackling twisiting mountain roads a real entertainment. Our trip back to Blighty was on the K1200RS which has also been given a makeover to improve the looks and wind and weather protection. The windscreen can be adjusted to either high or low positions and it definitely keeps the rain off. It is smooth and fast on motorways, but the suspension felt a little wooden on twistier roads and lacked feedback. BMW’s new lightweight EVO braking system is fitted as standard. It’s claimed to improve stopping power by 20 per cent and certainly feels strong although constant downpours on the return journey meant it could not be put to the ultimate test. On the road list prices are £6795 for the R, £9550 for the RT and £9350 for the K1200RS. ABS is a £750 option. An SE version of the KRS costs £10,305 and includes ABS, heated grips, pannier rails and a luggage rack. The full test will be published in MCN on April 17. BMW is now offering a year’s warranty on used bikes, providing they are bought through an approved dealer. Contact dealers for details. UPDATE 2: Getting Dirty with the F850 GS I have to admit that I’m not really the off road type.